Most of us have had some kind of online identity for over a decade. The good, the bad and the ugly of everything we are is scattered all over the internet, like a trail of digital breadcrumbs. But what if someone wanted to use this information against us? Here are four reasons why we sometimes choose to be anonymous online. Most search engines track your search history when you look for something online. Your IP address, time date and a unique identifier is logged and if you’re signed into a site, your email address and name will also be traced. It’s quite alarming to think that search engines save all this data about us, but most of us are either unaware of this or don’t really care that we’re leaving a digital trail behind us. The information collected can then be sold to advertisers who target us with those ads that seem to follow us everywhere we go on the internet. Annoying yes, but tolerable, as personalised searches can bring more refined results; helping us find the things we want, faster. But for those of us searching for things that we wouldn’t want a third party to know about (e.g. embarrassing medical conditions), the idea of this information being stored causes concern. But there are some search engines – DuckDuckGo and Startpage – that don’t save your personal details are perfect for online users who want total privacy. Thanks to the internet we can connect with people who have the same weird and wonderful interests as us, but not everybody is willing to fess up and share their guilty pleasures and lifestyle choices with the world. Inventing an online persona, using a fake name is a safe way for people to come forward and join the discussion – free from judgement from the people they know. Adopting different personas and sharing different interests with different groups is how most of us manage our overall internet image. But constantly adjusting our privacy settings and sharing more and more of our inner lives with strangers can start to affect our real relationships. For instance, your aunt may be your friend on facebook, she sees a limited amount of stuff on your profile. You wish each other a happy birthday and comment on her statuses every now and then, but that’s not really keeping in touch. Spending your time seeking approval from people who you will never meet is a poor substitute for human interaction. Sometimes it’s worth getting out the phone book and catching up with your family and friends, the old fashioned way. Trolls are obnoxious bullies, who take great pleasure in belittling people for no logical reason. It’s unlikely a troll will ever meet the object of their vitriol, but if they did, would they have the guts to insult them to their face? Probably not. Some argue that using real names on forums and comment threads would put a stop to trolling once and for all. They believe that if you can’t stand by your opinions then you shouldn’t be writing them on the internet in the first place – and while that is all well and good, enforcing that kind of restriction would be nearly impossible. Anyone booted off a forum could set up a fake email address on a VPN, register under a pseudonym and start trolling all over again. Cyber bullies also seem quite happy to put their real names to horrible comments. Cyber bullying via social networking sites has lead to a string of suicides in recent years, proving that the online disinhibition effect is ever present, even when the anonymity mask is off. The choice to remain anonymous online is an important freedom that ‘hacktivist’ groups like Anonymous fiercely defend using digital tools as a means of protest against government surveillance and censorship. 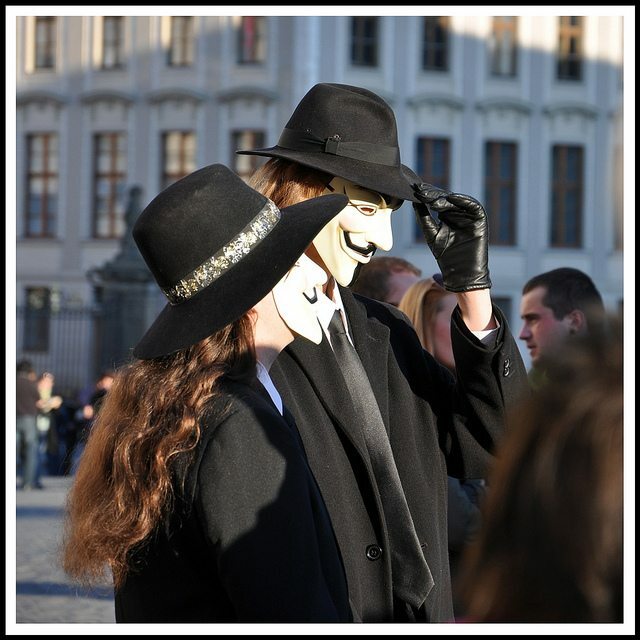 Some argue that the internet was built on anonymity and therefore if you wish to stay anonymous online you can. But chances are most us of would find total anonymity too much, as we are dependent on logging in as ourselves for many different things in our working and social lives. Internet privacy issues are constantly changing as technology develops so it’s important to take online safety seriously. Be cautious when giving away any information about yourself and use strong passwords that can’t be guessed and change them regularly. What steps do you take to protect your identity online? Leave your comments below.